The University of Pennsylvania traces its origins to the 1740s and Benjamin Franklin’s vision for a new type of learning institution, which became the nation's first modern liberal arts curriculum. Penn is also home to the nation's first medical school, with its university teaching hospital dating from the 1870s. The University is also associated with historically significant technological inventions and innovations. In 1946, Penn introduced ENIAC, the world's first electronic, large-scale, general-purpose digital computer. Other Penn milestones in science and technology include the pioneering work of Eadweard James Muybridge in motion photography, begun in the late 19th century under the University's auspices. Since 1923, fifteen Penn scholars have been awarded Nobel Prizes. Today Penn is a major research university, comprising twelve schools offering graduate and professional programs, including the schools of Medicine, Dental Medicine, Engineering and Applied Science, Nursing, and Veterinary Medicine. Among numerous interdisciplinary education and research programs are the undergraduate Health and Societies Program and the graduate Science, Technology and Society Program, both under the auspices of the Department of History and Sociology of Science in the School of Arts and Sciences. The Graduate Group in History and Sociology of Science embraces science, technology, and medicine in an integrated program and explores the relationships between them. In general, it admits students who wish to be prepared for research careers. The Barbara Bates Center for the History of Nursing, established in 1985, encourages and facilitates historical scholarship on health care history and nursing in the United States. The Center's interdisciplinary education and research programs include a University Honors course for undergraduates and two graduate level courses on the history of health care. The Center also sponsors interdisciplinary seminars and awards two fellowships for scholars. The University of Pennsylvania library system includes holdings in many areas, with 5.6 million printed volumes and archival collections spread among the main library and satellite subject libraries in biomedicine, chemistry, veterinary medicine, engineering, and math / physics / astronomy. Manuscript collections include the Edgar Fahs Smith Memorial Collection devoted to the history of chemistry, comprising early and modern works on chemistry, alchemy, early medicine and pharmacology, dyeing, metallurgy, mineralogy, and pyrotechnics; biographies of chemists; works on the chemical industry; and the history of chemical education. Other collections relating to science, technology and industry include: the records of the Philadelphia Society for Promoting Agriculture, 1785-1982; the John W. Mauchly Papers, comprising correspondence, documents, and research materials relating to the life and work of Mauchly (1907-1980), inventor of the first electronic digital computer; and the Samuel Wetherill Companies Records, business records, 1762-1899, of the store and White Lead Works founded by Samuel Wetherill in the late 18th century. 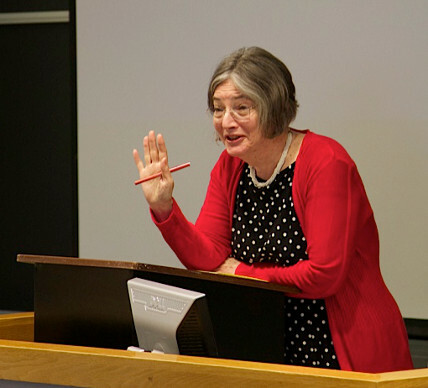 Ruth Schwartz Cowan (UPenn) reflecting on her work, colleagues and students at the University of Pennsylvania. Philadelphia, May 2013.